Zazu has helped the Royal Family with many duties, advising and bringing the morning report. But within his wide range of expertise, his hardest task was the one that involved little royal cubs with a strong will. This are the adventures of Zazu when he was asked the most. Shortly after the presentation of Simba, Mufasa had to return to his patrols around the Pridelands, keeping them safe and protect the Circle of Life. Shorly after that, Sarabi returned to her position as leader of the hunting party. Infant Simba had grown into a mischievous cub and Zazu was assigned to watch over him. "Zazu! Can I leave the Pride Rock?" Simba asked. "Never, young prince! Well, not soon. When you are old enough and your father approves, I'll guide you through the kingdom. But as I said, not soon!" Before Zazu could finish his lecture, he noticed something was missing. "oh, not again! Simba, where are you!" No response. Zazu sighed and flew off to find the stubborn cub. Simba has run off to find somebody to play with. Soon he found Tama, a girlish lioness cub, the best friend of Nala. Simba had met Nala once but he didn't dare to talk to her. "what are you doing?" Simba shyly asked the duo. "enjoying the sun, we are not going anywhere today! We are relaxing!" Nala answers. "yes, no boyish rough play!" Tama accludes. "you can join us if you like!" Nala smiles. Tama sighs. "this is for girls, boys cannot be quiet!" Simba blushes. He likes Nala, but without Tama. Zazu reaches the sunny spot on Pride Rock just after Simba left. "have you seen Simba?" he asks the two young lionesses. "maybe.. you were supposes to BABYsit him right?" Tama smirks. "euhm no, we are playing hide and seek!" Zazu tells the lionesses, not wanting anyone to find out he lost the cub out of sight. "owkay.." Nala smiles. "Then we will join you seeking!" Tama growls. "I won't tag along! but see you afterwards!" Nala runs off, followed by Zazu. "Simba, where are you?" they shouted. But no sign of Simba. "What do we do now?" Zazu sighs. "follow me!" Nala jumps off the side of a rock at the behind of Pride Rock, Zazu flies right behind her. 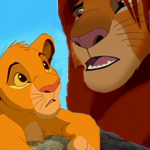 Meanwhile, Simba sneaks up to his uncle Scar, who is in an argument with his new love, in front of Scars den. "Scar, you don't do much, you make plans and you never fulfill them!" the lioness growls. "I never fulfill my plans, Zira?" Scar responds irritated. "Maybe that is because you don't give me a moment alone to work on my plans!" "What plans?" a curious Simba greets his stumbled uncle. "well hey there, little Simba.." Zira grins with a fake smile. "perfect timing, nephew", Scar replies, giving Zira a sheer eye. "just..eh, plans for an, eh.. family trip to the waterhole..with, eh.. you, Zira, and, eh.. that Tama and Nala cub.. "
"yeah.. that was supposed..to be a...surprise" Zira adds with a foul look at Scar. "wow!" Simba jumps around. " That will be my first time off Pride Rock! I can't wait to tell dad!" "oh no, don't spoil the surprise.. your dad is, eh.. invited too and must not know..yet!" Scar looks serious. "Well, I run forward and you can send Nala Tama and Zira after me towards the waterhole! Let's do this trip now!" "No, Simba, wait..!" Scar tries. But Simba scatters off. Zira smirks. "This might be in our advance, my love.." she grins. "he won't survive that long in the savannah.. inform Shenzi and the other hyenas!" Scar smiles. "you, my love...are very..usefull.."
Scar turns around and sees Zazu and Nala. "Well well, the Royal Mayordomo is babysitting another cub again?" he sneers. "no time for your cynism, have you seen Simba?" Zazu asks. "ehm..no,no. Sorry." Scar stands up and Zira follows, they walk slowly towards the inside of Scars den.